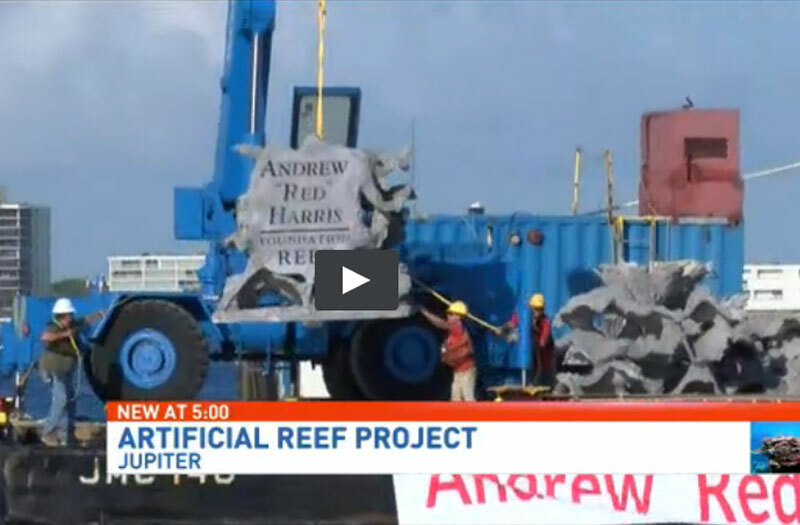 "We need more responsibly built artificial reefs. The days of dumping junk in the ocean to create marine habitat are over. Artificial reefs today should be designed and crafted structures that, while having enhanced features and exhibiting the influence of man, ultimately must conform to the aesthetic of the natural reef." REEF CELLS ARE A NEW AND UNIQUE SOLUTION TO BIO-MARINE ENHANCEMENT. REEF MODULES DESIGNED TO LOOK AND ACT LIKE NATURAL REEFS, REEF CELLS ARE DESIGNED TO PROVIDE THE MAXIMUM AMOUNT OF SURFACE AREA AND THE LARGEST NUMBER OF INTERCONNECTED VARIED SPACES USING THE SMALLEST AMOUNT OF MATERIAL. Traditional man-made habitat structure has been limited to sinking scuttled ships, obsolete equipment, and previously purposed concrete items; none of these artificial reefs look natural and many appear out of place in the marine environment. Many currently engineered artificial reef designs appear geometric, symmetrical and uniform; these shapes usually conform to the limitations of their fabrication method and usually emphasize ease of construction or deployment rather than compatibility with any natural aesthetic. Even reefs built from piled limestone boulders usually look like a pile of rocks and, given the mass of material used, these rock piles produce very few opportunities for habitat or colonization. REEF CELLS maximize the productive capacity of the artificial reef by providing many interconnected cavities and internal surfaces exposed to sunlight and water current. The ratio of overall surface area and interconnected interior space to the amount of material used and the minimum sea floor area occupied is the highest of any artificial reef design. The size and spatial organization of the interior voids are designed to provide a specific habitat environment favored by a wide range of varied and diverse marine organisms. Christopher Xavier O'Hare is an American artist and architectural sculptor with works exhibited throughout the United States and on projects from Okinawa Japan to Abu Dhabi UAE. His art studies started in New York and continued throughout Europe. Originally trained as a Architect/Engineer and Landscape Architect, O'Hare switched careers after years of designing commercial and private gardens to devote his full attention to architectural art. He founded Pineapple Grove Designs in Delray Beach Florida in 1988 and offered his work to architects and clients throughout the world. O'Hare's collection of bas-relief and three dimensional sculptures are inspired by plant, animal, geometric and arabesque imagery with references to traditional, historic and contemporary themes. O'Hare's body of work includes commissions by most branches of the Federal Government, State, Municipal and Institutional clients. O'Hare's concern for environmental issues led him to a parallel career in bio-marine enhancement. He has several U.S. Patents for his inventions in this field and he currently builds artificial reef modules known as REEF CELLS. O'Hare has provided these without profit to foundations and government agencies and has multiple deployments throughout South Florida. 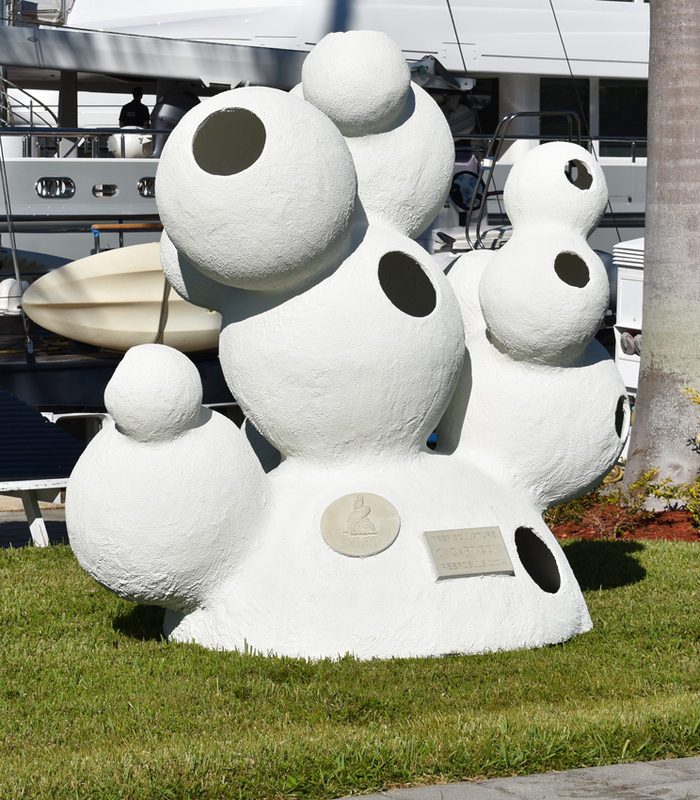 Most recently O'Hare has made the resources of his art studio, known as CXOART, available to REEF CELLS in a joint venture with Miami Body Casting for the purpose of building an Art Reef in the near shore waters of Fort Lauderdale Florida. The reef, to be known as 1000 Mermaids Reef will be funded by contributions from people who love the ocean and want to help the environment by participating in the creation of a very bio-productive artificial reef that will also be fun to visit. New Coral Lok frag plugs are revolutionizing the way living corals are attached to underwater reefs. These coral fasteners can immediately attach a living coral to a coral reef with a simple twist. The screw shaped base of the Coral Lok frag plug is designed to easily and securely mate into the female threaded Coral Lok receiver. The coral is fixed and ready to grow over the plug base and onto the reef rock. The reef surface no longer needs be chiseled and roughed up in order to remove living bio-film before a transplanted coral can be attached with chemicals. No time is wasted waiting for epoxy adhesive to harden or fumble with plastic zip ties before the diver can move on to the next coral. Hundreds of corals can now be attached in the time it currently takes to attach ten. Plus Coral Lok frag plugs can be screwed into special production racks in the nursery and the entire rack can be transported to the reef with the living corals still attached to the rack. The coral polyps growing on the Coral Lok frag plugs which are secured to the rack are protected from jostling against each other during nursery cultivation and transportation to the reef. The Coral Lok system allows for the living coral polyps to be grown and deployed more securely and quickly with less handling and with less stress and trauma to the fragile coral animals. Coral Lok fasteners are made from inert materials that will not harm the corals or the reef. They will not corrode, oxidize or breakdown from electrolysis or sunlight. Composed of 90% calcium carbonate, they are strong enough to support the living coral and hold it firmly in place while the coral naturally grows to self-attach to the reef. Each Reef Cell artificial reef module can be fabricated with hundreds of Coral Lok receivers making it possible to create new coral reefs in just a matter of days where no reef existed before. And the ease of Coral Lok installation enables coral attachment to be accomplished by volunteers with even minimum skill levels. Coral Lok attaching devices are patent pending and available to coral reef research and restoration organizations worldwide. Please contact us for more information. REEF CELLS start out with a heavy irregularly shaped concrete base which provides both support to the upper structure and resistance to the dynamic forces found in the ocean. Multiple layers of free formed, concrete "veneers" are assembled around a concrete column designed to add rigidity and facilitate lifting the finished structure into place. The completed structure is then coated with a crushed calcium carbonate and cement mix designed to encourage colonization by attaching organisms. Ballast base provides resistance to dynamic forces and stability against movement. A central column ties the layers together and provides a central lifting point for ease of deployment. Multiple layers of undulating forms connect to form crevases, tunnels, chambers and ledges. Each layer is perforated to facilitate water movement and allow sunlight to reach interior spaces. reef cells are delivered to their final destination using a diver directed placement system that assures surrounding natural reefs are protected from risk Inherent in "push overboard deployments"
REEF CELLS' goal is marine enhancement designed to provide species specific habitat and optimized substrate for colonization by attaching organisms while preserving the natural marine aesthetic. Natural reefs benefit by experiencing reduced stress typically caused by frequent diver visits because REEF CELLS provide an alternative natural underwater attraction and dive experience thus drawing human activity away from more sensitive nearby natural reefs. Divers prefer natural reef formations. The complexity and intense productiveness of REEF CELLS increase their attractiveness to divers. Marketing and social media opportunities increase awareness of this recreational asset while strengthening an area's "brand" as a unique diving destination. Reef tourism provides significant economic benefit throughout local economies. Boat charters, dive shops, hotels, restaurants, car rentals, travel companies and many other tourist industry businesses benefit from a healthy and robust diver destination. The economic benefits of a continue to provide positive repercussions in other market sectors that support tourism. These videos are a portion of the original videos posted by the above mentioned owners. They are posted here to identify the REEF CELL modules on display. Christopher O’Hare first started worrying about the fish in Lake Worth Lagoon when he moved to Ocean Ridge in 1992 and saw the sea walls that had replaced the native mangroves that grew at water’s edge. “Mangroves provide ideal habitats for fish. It’s one of the big issues facing environmental management of Lake Worth Lagoon,” O’Hare said. New REEF CELL modules ready for deployment at the Blue Heron Bridge dive area. Come snorkel in 8' of clear protected water just off the beach at Phil Foster Park. This spot is a favorite dive sight in Palm Beach County. Out of tragedy-- something positive for the community. 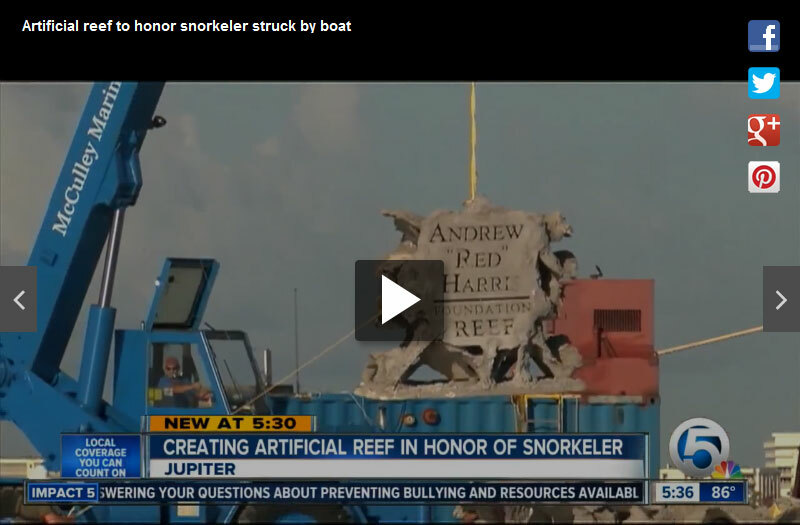 A Jupiter family is sinking an artificial reef, in memory of a young man who was killed while snorkeling last summer. Reef Cells is proud to join Coastal Conservation Association (CCA) in supporting the creation of the Andrew "Red" Harris Foundation Reef. From the very beginning of this project, Reef Cells has worked with everyone to insure this project is an environmental success and a great dive experience. All Reef Cell modules has been built in the Reef Cell facility in Boynton Beach at the huge sculpture studio of Chris O'Hare. Mr. O'Hare has personally supervised every aspect of construction and his guiding design influence and hands-on direction has brought this project to completion on time and on budget. All that is left at the time of this writing is to transport the Reef Cell modules by truck to the Port of Palm Beach where they will be loaded onto a seagoing barge for final deployment offshore from Jupiter, Florida. Deployment is expected to take place in mid August. 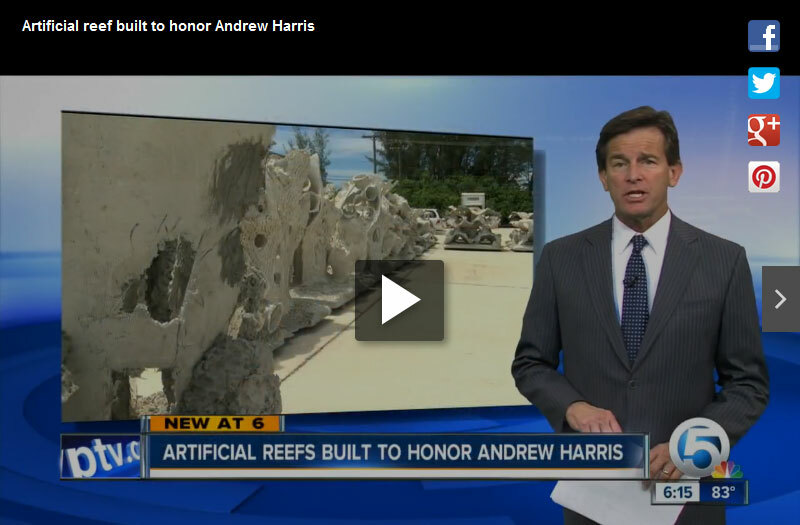 The Andrew “Red” Harris Foundation is set to deploy an artificial Reef Cells off the coast of Jupiter as a memorial to Andrew Harris, who was killed while snorkeling last year. The reef, which is tentatively scheduled to be sunk Aug. 19, will be made of 40 “reef cells” modeled after Bahamian coral heads, and will cost about $100,000.